The visual medium today has become one of noise and relentless action. In such times of high expectation from visuals, it has become difficult for a director to fill a second with 24 frames of silence and yet pregnant with the ringing of many voices. Trust Sofia Coppola to do that with aplomb. 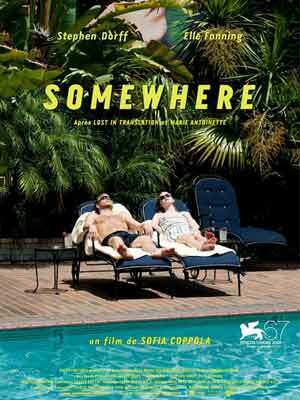 In straightjacket terms, "Somewhere" is the character study of one guy, successful actor Johnny Marco (Stephen Dorff). He is a star with fans and haters alike. He is an average, hugely successful star and takes everything that comes with it without a second of thought - women throwing themselves at him, fans adoring him and press making a hullaballoo of his lifestyle. What these people don't know, but the audience does, is that his life is as empty as any 'life' can ever get. There is sense to life, nor purpose. His 11-year-old daughter from a previous marriage fills a few of his days, but after her departure he is back walking the barren landscape of life. Thus, there isn't much happening on screen and it is an indication you get with its opening long shot where on an empty stretch of road somewhere, a Ferrari goes round and round till it stops and a man comes out of it. At that very instant you know this is a different ride that might seem slow and 'art-house' to those who have not yet experienced loneliness, but become a searing achievement to those that have. Yet, this - the attempt to capture emptiness and desolation on screen and a story that is almost a non-story without a formal resolution in the end - has been tried before. What is unique is Coppola's direction, a glimpse of which you see in her film "Lost in Translation". In many ways "Somewhere" is similar to "Lost in Translation", becoming a kind of prequel and parallel-story at the same time. While in "Lost in..." we were given a glimpse of an ageing actor who is a spent force, here we see one in his prime, and we see exactly where the older actor in the first film must have spent his force. Sofia's penchant for long shots is scintillating. In one of the most surreal shots of the film, the star is sitting with white foam (used for makeup) fully covered up till the neck with only his nostrils left open. The makeup artists leave him with the white paste to dry and in that empty room, the camera very gently zooms into his white face, with the sound of his breathing filling in. The symbolism of claustrophobia is gently, yet vociferously made. Mahatma Gandhi also makes an appearance in the film, in an obvious comparison - the emptiness, excess and purposeless of Johnny is compared to the fulfilment, frugality and sense of purpose of the Mahatma. Perhaps Sofia, in this scene, as in the entire film, intends to make the same comparison with the lives of folks who will watch the film someday, somewhere.